Sony Ericsson has done an extremely good job at reinventing Sony's classic Walkman brand for the modern age. Coordinated aesthetics, quality products and above all an exceptionally good media player mean that Walkman phones have the edge for music fans considering an alternative to the ubiquitous iPod. 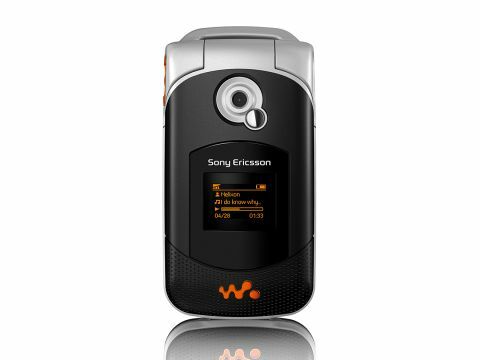 The W300i comes in at the lowest end of the Walkman range, but is still a notch or two above Sony Ericsson's entry-level products. It's similar in look and feel to the budget Z530i, though the cheaper phone gets by with a 65,000-colour screen and tri-band connectivity and has no radio or flight mode - the W300i features improvements on all of these and more. Looks-wise, it utilises Sony Ericsson's latest take on the orange and black or white livery of the Walkman series - with a little less orange than on some models, which has got to be a good move. It feels incredibly light, especially surprising since at first glance it looks a bit on the squat side. There's a good-sized if aesthetically questionable loop at the top for hanging the phone from your neck by a lanyard, though you'll have to supply your own, as it doesn't ship with one. There's a large orange music play/fast-forward/rewind control on the side, which will control your sounds without the need to open the flip. This also doubles as your voice control activator if you press and hold while the flip is up. Incidentally, pressing the side button while the music player is off allows you to display additional info on the monochrome outer screen, such as memory status and today's appointments. There's a large infrared port on the opposite side of the play button, but no other external controls. By the way, as well the standard-issue W300i, you can get also the phone in a special Robbie Williams package courtesy of the former Take That-er's multimillion pound deal with T-Mobile. The back-plate has that Prince-style squiggly R that Robbie's using as a logo these days, as well as exclusive Robbie ringtones, wallpapers, stick-on transfers for the casing, a live MP3 track and a live video from the beginning of his world tour in Durban, South Africa. Flip the lid of the W300i and there's a nice big 36x29mm 262,000-colour screen and a very distinctive looking keypad. It has an unusual overlapping keys design that looks like a great use of space, but actually takes a bit of getting used to, and you'll need to keep your eyes on the buttons until you get the feel of it. The navigation pad too is sunken and looks good but proved a little fiddly to use in practise, and we regularly overshot our aim on the navigation menu. With practise though, you'll find additional quick key combinations that can be accessed via some deft pressings of the nav pad, including the camera, messages, voice record and contacts, with the option to programme other operations. In contrast to Walkmans past, the dedicated music player button is a very tiny affair squeezed down the bottom of the keypad, as is Sony Ericsson's customary dedicated switch-on button. It's no secret that the Walkman engine is one of the better MP3 (and AAC) players on mobile phones. It also goes good and loud(ish). It's intuitive to use and works fairly seamlessly but the normal settings sounded a tad bass-heavy to these ears, though you can boost the low end even further with Sony's Mega Bass facility, and there's the option of a bit of finetuning thanks to a five-band graphic equaliser. And if you get bored with your own tunes, there's always the option of the rather excellent FM radio on board, which offers 20 preset stations and RDS information such as channel, programme and track info though as usual you'll need to use it with headphones, since they double as the antenna. There's a large speaker on the back but you're more likely to use the player with the Walkman headphones, which have that nifty noise-cancelling plug on them so you can groove undisturbed in your sonic world, and thanks to the option of a 3.5mm mini jack plug, you can upgrade to your favourite 'phones if you feel the need. Usefully, there's a flight mode which allows you to use the music player even while the phone itself is switched off, which could save you an embarrassing in-flight moment. The camera is a basic VGA model which is fine for quick snaps that you can send on via MMS, but won't really produce anything worth printing at a decent size. Still, it's quick to get into (press and hold the top of the nav pad) and it offers a 4x digital zoom, burst mode (which takes four pics in a second) and video recording options. That impressively bright and clear screen shows your pics off to their fullest but there's no fl ash. Elsewhere, Sony Ericsson's media manipulation programs are all in evidence. MusicDJ allows you to create your own ringtones from a library of soundbites, while VideoDJ allows you to add text or pictures to video clips which you can then send as MMS. PhotoDJ allows you to add frames, clip art and effects to your photos. There's a NetFront full web browser with RSS feed support, as well as an integrated Wap browser, plus infrared and Bluetooth wireless connectivity (there's also the option to use the phone as a Bluetooth remote control) with a USB cable for secure PC synchronisation. There are three games too, including the Tamagotchi-style NeoPets, which could prove costly since it requires a web account for regular downloads, Puzzleslider and the Tetrix-style QuadraPop. As ever, the battery seemed to fall short of the claims made for it but with moderate use it lasted for three to four days, which is perfectly acceptable. For music playback only, with the flight mode engaged and the flip closed, it lasted well over a day, which seemed quite good too. And speaking of batteries, there's no need to remove it to get to the memory card, which slots in just below the back of the phone. A 256MB Memory Stick Micro memory card comes as standard (these should soon be available in up to 1GB sizes) which will hold up to around 60 MP3 tracks, and more in AAC format.